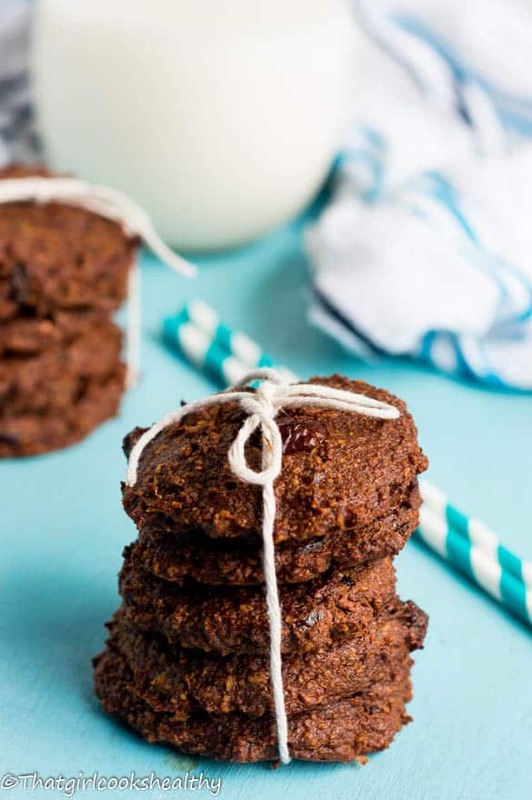 Chocolate cherry cookies recipe – This delicious decadent chocolate cherry cookies are a healthy grain free alternative snack. Now that Christmas is fast approaching, I’m certain that the vast majority of us are running around frantically trying to ensure there isn’t a last minute dash. One thing I love about this time of year is the opportunity to reaffirm my closeness with family and good friends. 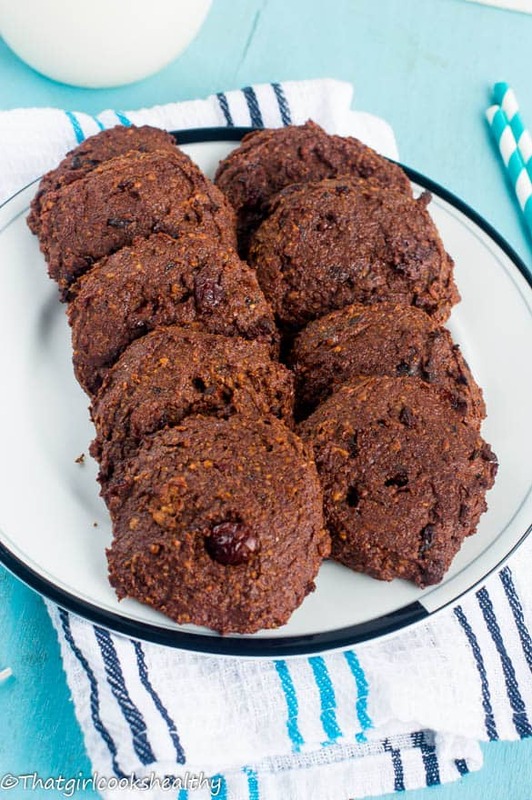 As cooking is my middle, first and last name, my loved ones are always spoilt for choice, when it comes to baked goods including these delicious chocolate cherry cookies. Christmas presents come in all shapes and sizes ranging from material to baked goodies. I have received my fair share of handcrafted gifts in my time – all of which were unique and creative. Whether you’re looking for an exciting recipe to impress your friends and/or family with or wishing to step outside your comfort zone this season, I have the perfect recipe for you. It’s gooey, chocolately, addictive and HEALTHY – How can healthy and chocolate be in the same sentence? That’s the million dollar question which many like to ask. The answer is raw cacao powder – additive free and full of antioxidants. 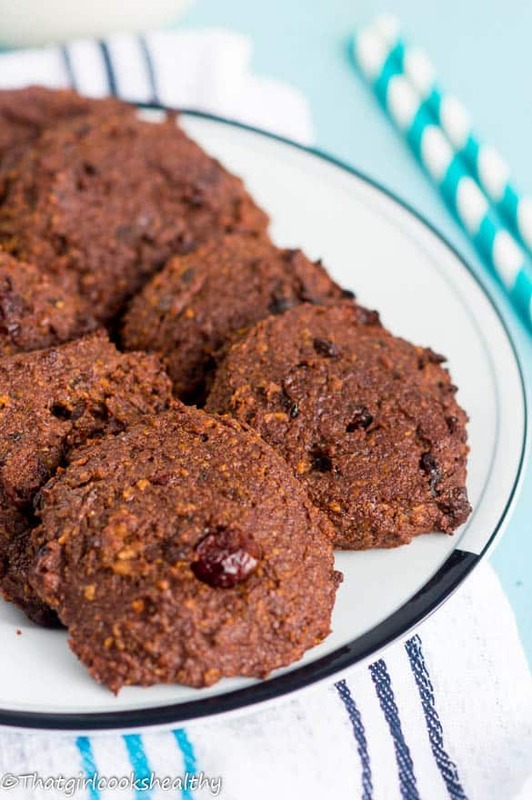 My chocolate cherry cookie were inspired by Megan from The Detoxinista she made these delicious cookies using walnuts earlier this year. Not only did they taste amazing I loved the fact that they were flourless and dates were used instead of processed sugar, so thumbs up Megan. 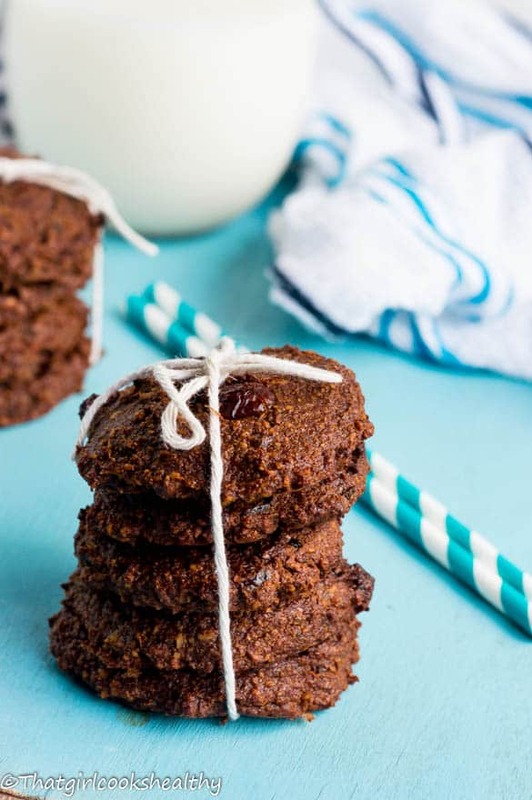 Since trying my hand at these grain free cookies, my creativity soon kicked in and being a self-confessed chocoholic and fruit lover I couldn’t resist making my own version. My rendition of Megan’s healthy cookies are made similarly with the additional cacao powder, cacao nibs and dried cherries. The chocolate and cherries really work well together – creating an infusion of chocolately fudgeness with a fruity twist. The recipe isn’t difficult either, it’s one of those complex looking yet simple to do. Here you can see I’m in the process of pulsing the walnuts, cacao powder, dates and baking soda. Next it’s time for the flax eggs – two should be suffice. I also added a tablespoon of water to loosen the batter, so add the additional water if need be. Spoon the batter on some parchment paper to create the cookies. This is probably the most time consuming part. Press down and shape – add some more cacao nibbles and cherries along the way. The final product – soft, gooey cookies. 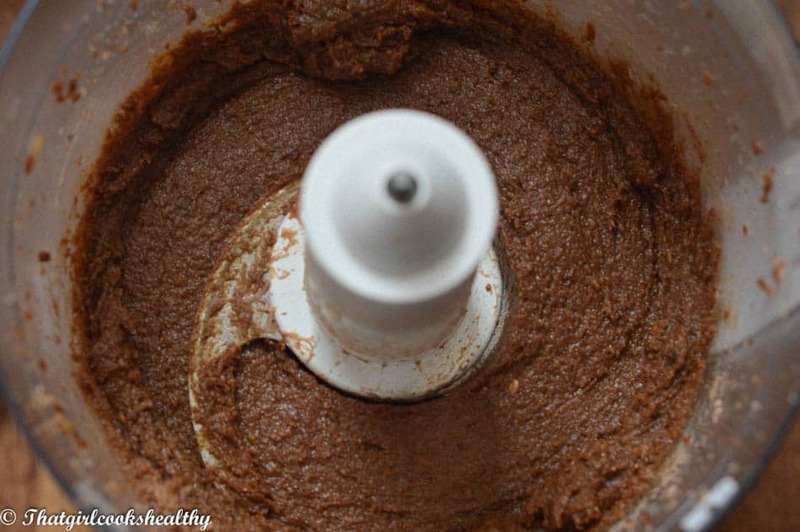 Using a food processor with an S blade, begin to pulse the walnuts adding a few dates at a time. 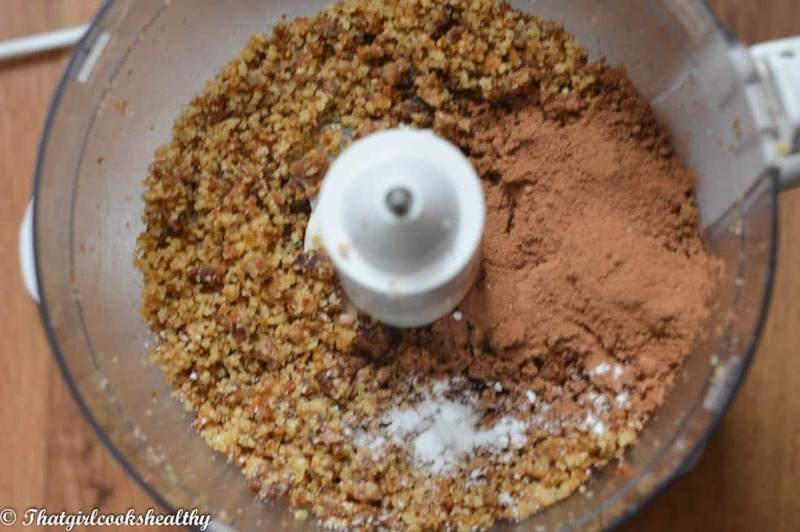 After a minute, the two ingredients should be ground. Add the pink salt, baking soda, vanilla and cacao powder to the food processer and pulse for 20 seconds. Add flax eggs and continue to mix the batter into a smooth consistency. Add the additional tablespoon of water if the mixture isn’t soft enough. Finally add the cherries and cacao nibs and run the food processor for 10 seconds to allow the extras to fold in rather than grind out. 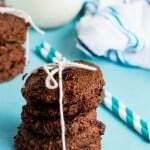 Heap a tablespoon of the chocolate batter onto the baking tray and form in a circle. Repeat this step until all of the mixture is used. Feel free sprinkle more nibs and cherries over top of the cookies and gently press them in. Bake the cookies for 12-15 minutes, until soft with darkened edges. Those look amazing and I love that list of ingredients! OK – these look SO good. My favorite cookies from childhood were chocolate & cherry – but were packed with sugar, sugar, sugar, butter, and more sugar. These sound like an amazing healthy alternative. Can’t wait to try! Thanks Kate, there is something about chocolate and cherries that make an awesome combination. These look absolutely delicious! The ingredients sound perfect! These look gorgeous! My little girl is about to start school and I know she’s going to be hungry and need a snack at the end of the day so I’m looking out for healthy things to bake for her. These would be perfect. Yes these little cookies are definitely child friendly as they contain no refined sugars. I will try to create more child friendly recipes in the near future.